Anguilla was colonized by English settlers from Saint Kitts in 1650, and administered by Great Britain until the early 19th century, when the island - against the wishes of the inhabitants - was incorporated into a single UK dependency along with Saint Kitts and Nevis. Several attempts at separation failed. 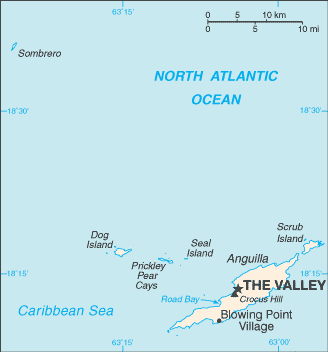 In 1971, two years after a revolt, Anguilla was finally allowed to secede; this arrangement was formally recognized in 1980 with Anguilla becoming a separate UK dependency. A maximum visa-free stay of 3 months is granted to holders of British passports, all European Union citizens and nationals of Andorra, Antigua and Barbuda, Argentina, Australia, Bahamas, Barbados, Belize, Botswana, Brazil, Brunei, Canada, Chile, Costa Rica, Dominica, East Timor, El Salvador, Grenada, Guatemala, Hong Kong, Honduras, Iceland, Israel, Japan, Kiribati, South Korea, Liechtenstein, Macau, Malaysia, Maldives, Marshall Islands, Mauritius, Mexico, Micronesia, Monaco, Namibia, Nauru, New Zealand, Nicaragua, Norway, Palau, Panama, Papua New Guinea, Paraguay, Samoa, San Marino, Seychelles, Singapore, Solomon Islands, Saint Kitts and Nevis, Saint Lucia, Saint Vincent and the Grenadines, Switzerland, Taiwan, Trinidad and Tobago, Tonga, Tuvalu, United States, Uruguay, Vatican City and Venezuela. In addition, holders of a valid visa issued by the United Kingdom and holders of diplomatic passports do not require a visa. Cape Air provides two daily non-stop flights to/from San Juan, Puerto Rico, where Cape Air interlines with most major airlines: JetBlue, American, Delta, US Airways, United, etc. Cape Air's flights are timed to make connections with the mainland. 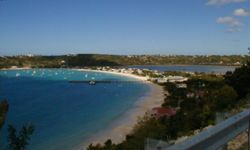 Cape Air's San Juan - Anguilla route is codeshared with United Airlines and can also be booked with JetBlue connections on JetBlue.com. As of June 2011 JetBlue is the largest airline at San Juan measured by ASMs, ending American Airlines' long dominance. Anguilla is listed as a JetBlue destination on their website thanks to the partnership with Cape Air. This is the most common method of transport between Anguilla and St. Martin. There is a chance of getting wet, so choose your seat carefully to sit facing the wind. If you experience sea sickness quite easily, ensure you take medication before boarding and if possible sit towards the back of the vessel for maximum stability. There are regular small public ferries from Marigot in French St. Martin that cross to Blowing Point, Anguilla in about 25mins. Ferries commence service from 7AM, and run every 45mins. The last ferry departs Anguilla at 6:15PM and St. Martin at 7PM. If traveling from Princess Juliana Airport (SXM) in Sint Maarten (the Dutch part of St. Martin), a dispatcher can direct you to a taxi (approximately $24 - $26 from SXM) for the 10-15min drive to Marigot. The public ferry costs $15 per person one way before 6pm plus $5 departure tax per person from St. Martin to Anguilla or $23 departure tax per person from Anguilla to St. Martin. There are also direct fast boats between Blowing Point (Anguilla) and Princess Juliana Airport (Sint Maarten) taking 30 mins to cross. Airport drop off is also provided with these services (though the boat terminal is only a couple of hundred metres/yards up the road from the Airport). As of 2015 the comprehensive StMartinbookings website for all ferry and boat routes to the regional islands has come online. Schedules & live availability for the fast boats from Anguilla to SXM are available for comparison there. A taxi to Marigot and the public ferry from there takes a little longer in terms of total journey time but will cost on average about $15 - $20 less than with the SXM Airport direct speed boat services. Driving is on the left-hand side of the road. Speeds are low, but the island is small. There are also a few roundabouts and stop lights throughout the island. Keep left and Give way to the right! Anguilla has everything you might expect from a Caribbean island, with gorgeous bays, some of the best white sand beaches in the world, palm trees and the turquoise ocean all around. That lovely setting is of course what draws most travellers here, and it allows for perfect lazy days of sunbathing and swimming. There are some stunning coral reefs just outside the coast, which make it a fine destination for scuba diving or snorkelling. If you're not that sporty, hop on one of the glass bottomed boats to have at least a glance. Shoal Bay can compete with any beach in the world and has a great reef. Other popular bays are Barnes, Rendezvous, Road and Little Bay, but you can choose from 33 fine beaches in total. From April through November, many of Anguilla’s beaches are nesting grounds for leatherback, green and hawksbill turtles. Maundays, Meads, Captains and Limestone Bay offer the best chances to witness this wonderful natural phenomena. At the Island Harbour you can see local fishermen and sailors at work. The Old Salt Factory & Pumphouse at Sandy Ground is one of the few historic sights. The 1785 Wallblake Househas been beautifully restored and is Anguilla's only surviving plantation house. If you'd like to dive into the island's history and cultural heritage further, make sure to visit the Heritage Collection museum. It has a good collection of photographs, artefacts and documents from the prime days of the Arawak Indians till the present. At 213 feet above sea level, Crocus Hill is the highest point on the otherwise flat lands of Anguilla. On it, there are a few remains of the Old Court House. More importantly however, there's a great view from the top over the underlying bay, which is extra spectacular at sunset. On the way to Crocus Hill is The Old Valley, an area with a few unspectacular but locally important church buildings. Anguilla has many farms of corn, peas, tomatoes and other crops. To see, buy or learn about plants and animals in Anguilla one can visit The Department of Agriculture, located in The Valley, Anguilla. The Anguilla National Trust can provide information on Anguilla's environment and conducts tours. Its main task is to preserve Anguilla's natural environment, historic and cultural resources and archaeology. If you're interested in gardens, try the Hydroponic Farm and Organic Gardens, at CuisinArt Resort and Spa, West End Village or the Endangered Species Garden and Indigenous Local Plants Gardens at the Cap Juluca Resort. Hiking, Art Gallery Tours, Horseback Riding at Seaside Stables, El Rancho Del Blues and CLiffside Stables. Tennis, Golf at Play-A-Round Mini-Golf Park and Temenos Golf Club, Spa and Wellness, Glass-bottom boat, Swimming, Snorkeling, Fishing, Festivals: Anguilla Summer Festival, Tranquility Jazz Festival, Moonsplash, Festival Del Mar, Annual Anguilla Yacht Regatta and Annual Lighting of the Christmas Tree. Scilly Cay, a small island a few minutes away from the main island. Though the East Caribbean Dollar (XCD) is the local currency, most places frequented by tourists price goods and services in U.S. Dollars (USD) and all locations accept U.S. Dollars for payment. On occasion, you may receive small change in a mix of USD and XCD. Credit cards are taken at hotels and restaurants (not everywhere will accept Amex. Mastercard/Visa preferred). There are many places to dine in Anguilla, with a wide variety of cuisines to chose from. The prices also vary depending on the selected restaurant. Scilly Cay in Island Harbor; pronounced Silly Key; take a boat or swim out to this tiny island off the island. Food is great also the rum punch!! This is a nice place to lounge on a Sunday afternoon. Roy's  On the beach at Sandy Ground; started originally on Crocus Hill by a British expat Roy and his wife, Mandy. Great bargain lunches on Fridays. Very well known for their fish and chips. Johnno's is an Anguillan landmark, run by John (Johnno) on Sandy Ground beach. It is an open air bar, restaurant and at night a dance club on the beach, often with live local bands. English Rose Restaurant, The Valley. Elvis Beach Bar, Sandy Ground. Gwen's Reggae Grill, Shoal Bay. Tasty's at the Dune, West End. Michel Rostant at the Malliouhana  Incredible view, an awesome view and great food. Conde Nast traveler rated this restaurant 100 out of 100. Hibernia  Unique food, gracious hosts and a wonderful time always. Worth the drive! Blanchard's  Great decor, which is unfortunately undermined by the bland food. Mango's  Directly on the beach, with wonderful seafood. Straw Hat  Don't miss the crayfish here! Altamer  Delicious lobsters big as orbiting moons, great service. Koal Keel Restaurant, The Valley. Kemia, Cap Juluca Hotel, West End. Pimms, Cap Juluca Hotel, West End. Le Bistro, Malliouhana, West End. da'Vida  Right on the beach in Crocus Bay. Great ambiance and great food. Chose from an array of hotels, villas, guest houses and apartments to rest your head at night. Anguilla is a safe island with a low crime rate. But please take necessary precautions: lock your doors at night, don't leave personal belongings in your unlocked rental car and don't give rides to pedestrians. The police station is in the capital, The Valley, as well as the hospital, Princess Alexandra Hospital. There is only one hospital in Anguilla, however there are many private doctors, including Hughes Medical Center located in West End. There are many medical clinics located in many villages such as The Valley, West End, East End and Blowing Point. Anguilla offers a variety of Spas and Wellness centers, Gyms and Healthy Food stores. Louis Price Fitness, George Hill. The beautiful people of Anguilla are incredibly friendly and hospitable. This page was last edited on 4 September 2018, at 03:30.